So, when we got off the Disney Cruise we hopped on a shuttle to Disney World. We were supposed to stay at the Coronado Springs Resort, part of the package we'd booked through Priceline, only the bus driver seemed to have inhaled too much pixie dust or something like that because he drove right past it. The next stop was the Animal Kingdom Lodge, and it looked great. I decided we'd all get out there and see if they had a room available. They did! 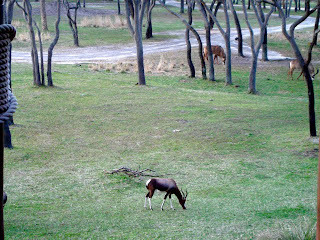 The cool thing about the Lodge, besides the magnificent lobby, is that you can view animals on the savannas right out of the hallway windows and from certain rooms (not the one we had). One morning, while Dave and the kids were swimming, I met up with a staffer from South Africa who spent 15 minutes talking with me about the animals there, which include zebras, giraffes, ostriches and vultures. For some reason, I am always mesmerized by vultures when I see them. Our first stop was The Magic Kingdom. 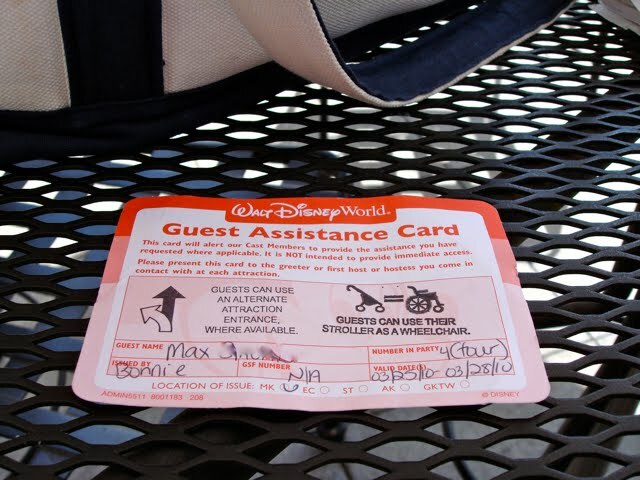 We picked up this Guest Assistance Card for Max at Guest Services. Crowded lines were going to be too much for him to handle, and he also tires out when he's been standing for too long. With the card, we were able to use the Fast Pass entrance or go in through an accessible one. It enabled us to wheel Max's stroller close to the entrance, so be sure to ask for that if you need it. Double strollers, by the way, rent for $31 a day, singles for $15 (it goes down to $27 and $13 if you rent for multiple days). 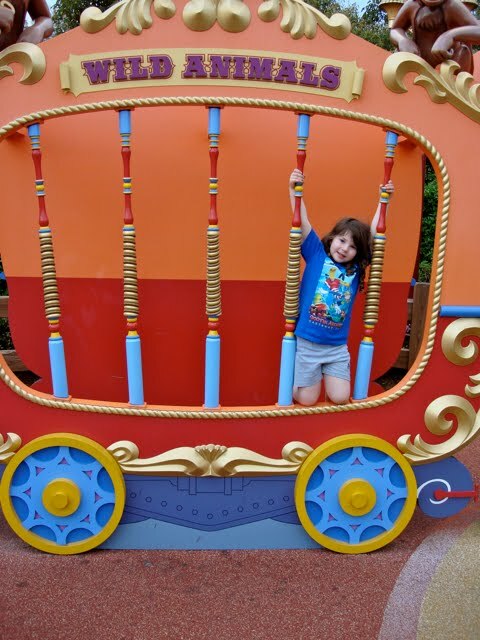 That can add up if you're planning on spending a fair amount of time at Disney, so it might be worth it to haul along your stroller from home. We did that the last trip, but got lazy this time around. I had high hopes that Max would be able to handle rides, because on our last trip even It's A Small World had made him sob. 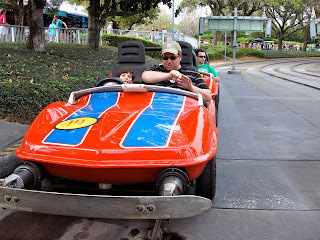 We eased him in by heading straight for The Speedway Racetrack in Tomorrowland. Max actually remembered it from two years ago and at some point gleefully lead the way there. We had to go on it several times in a row. After that, though, he was really unhappy about the Transit Authority ride, a slow-moving cart that gives you an overview of all the rides in the area. We figured Max would adapt over the next few days, and stuck with the characters after that. He really enjoyed visiting Minnie and Mickey's homes (they live separately—this is Disney, after all). 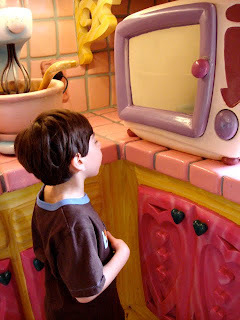 The microwave in Minnie's kitchen, with popcorn flying around everywhere, fascinated him. 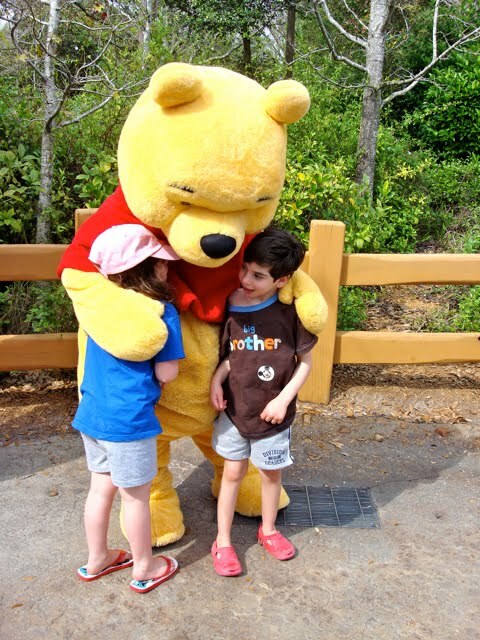 We'd booked a Winnie the Pooh and friends character dinner at The Crystal Palace. It's a big, bustling place with a gigantic buffet. Max got a kick out of Tigger, but he decided he wasn't having any of it and tried to make a break for the door. We'd already taken some food from the buffet and brought it to the table, yet there was nothing to do except bail. The manager was totally understanding. "Take some food with you," he said. Dave and Max headed back to the hotel (except they ended up riding the monorail for 45 minutes, Max's idea of a good time), and Sabrina and I had dinner, explored and went on rides. Then Max got room service, and he was content. Sabrina made me take a picture of the castle, which turns various colors at night, when it was purple. "I want Max to see!" she said. It wasn't quite the day I'd expected, but it was a very good day. 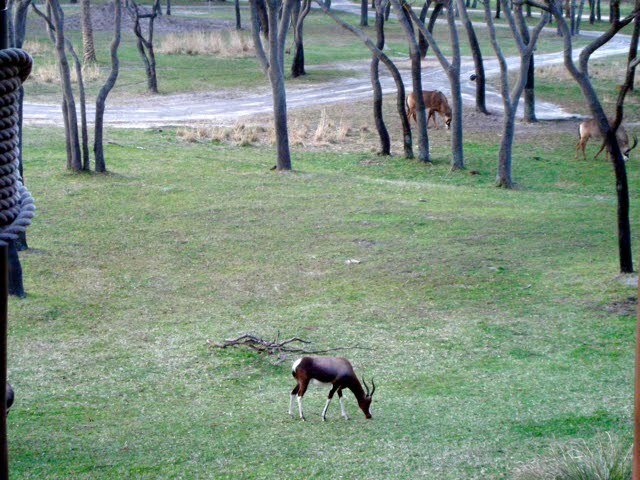 More tomorrow, including our memorable lion sighting at the Animal Kingdom Park. I told warned you I took a lot of photos! Ahhh, these kids of ours! Never know what their idea of a good time will be! Gee, Max seems to do better on each vacation you take--I guess the fun giant characters make up for the "sensory assault"--I wonder, if you desensitized him to the Small World ride by showing him the YOUTUBE version of it a bunch of times, if you could stand hearing the song over and over again--(lots of purple on that ride, too) he'd be more receptive to it next time you "do" Disney...? We seem to do better when we have "points of reference" to include seeing what we're gonna see on tv! What adorable pictures!! I can't wait until Margo is a little older and we can all go on vacation together. I love that Sabrina always thinks of Max. 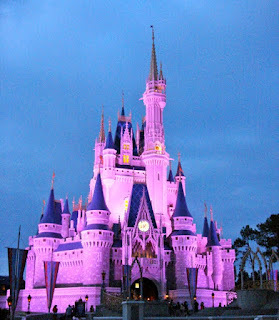 Of course, she'd want a picture of the castle when it was purple, for Max. You've taught them to love each other, Ellen. I TRY, but there are plenty of times when they are literally pulling each other's hair out!!! Felicia, yes, Max is doing better on every vacation and that is SUCH a brilliant idea to show him the YouTube version of It's A Small World for the next time. Actually, that's a good tactic to take for any future trips. You are always full of good advice. I have that song in my head and can't get it out. It wasn't too long ago my daughter always thought of her brother in times like this. Now that they are both teenagers that's gone but she does still watch out for him at school at least! I really admire the way you roll with the various situations that come up. You are such a great mommy! 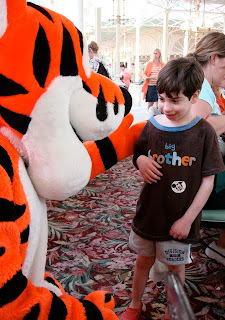 And it seems like Disney is very accommodating to children with special needs. Can't wait to read more! Ellen, I was daydreaming/assuaging my cruise/vacation envy by going on YOUTUBE and looking at the Disney videos of others, and the thought just came to me, because I find that pictures, video and "preparation" about what we're going to do and see makes the entirely new a bit less threatening. I saw that Test Track ride you mentioned on YOUTUBE too, along with a bunch of roller coasters (I could give those a miss) and other rides as well--a NEMO ride looked like a ton of fun! Disney ought to think about putting out a professionally made video of their kid-friendly rides to prep kids with sensory issues, and also to let parents know what kinds of services and accomodations they offer. I'll bet it would give them a business boost, and even a percentage of a percent helps in this economy! 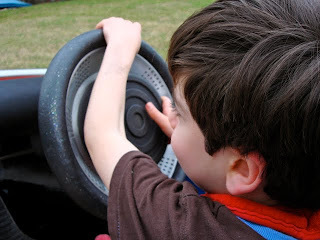 I just get the impression that Max blossomed on that holiday--it really does seem like (fun) therapy to me! Now I am all excited to go back!! Kepp the stories coming.